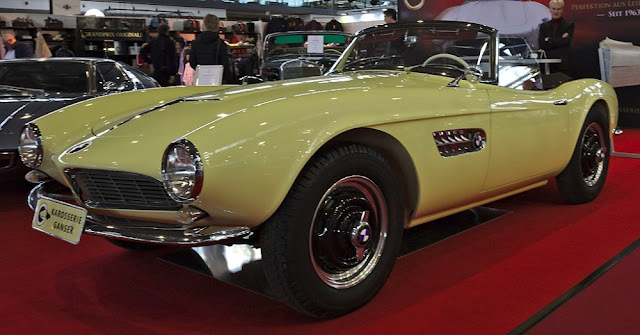 The BMW 507 was styled by Albrecht von Goertz. He was a German aristocrat - who owned an American industrial design agency. Goertz took the big box-section chassis of the BMW saloon car, and shortened it. He ended up with a taut and tidy 2-seater. The 507 was an unabashed attempt to crack the American glamour market. Post-war, BMW had watched their brand-image slide into mediocrity. It was high time the great German manufacturer raised its profile again. Hopefully, the 507 would be the car to do it. It was not to be. Just 253 BMW 507s were built. Both technically and aesthetically, the 507 was impeccably packaged. It did not sell well, though. Haute couture on wheels, the 507 took refinement to another level. But, that cost too much to produce. With the Second World War not long gone, it simply was not affordable, for most motorists. The 507 was not a 'driver's car'. It had none of the addictive challenges of some machines ... the overcoming of which are proof positive of advanced piloting skills. The 507 got its inevitably well-heeled occupants from A to B with a minimum of fuss. Not that it could not push on, if required. Should one have been a tad late for the opera, a quick boot - or brogue - on the pedal, was all that was needed to make up the time. The 3-litre V8 engine gave 160bhp. That translated to 140mph ... more than enough to catch curtain-up! 0-60 came up in 9s. The soundtrack from the twin rear pipes was music to the ears! At speed, the 507 was unflustered. Front and rear torsion-bar suspension saw to that. A relaxed ride at all times was the order of the 507 day. Of course, when it comes to design, it is the little things which count. And 507 detailing was second to none. Heat-extracting vents were a cross-hatched delight. And set off by the BMW badge. The vents' inter-locking lines were matched by the 'kidney' grille - a stylish revamp of a traditional BMW theme. The 507's front-end was shark-like - thanks to its beautiful, protruding nose. The long, flowing bonnet-line - and cute stub-tail - complemented each other perfectly. The 507 stayed in production for four short years. That was never, however, what the 507 was really about. Consummately-crafted, it took the motor-car into the realms of fine art. The 507 cost BMW more than it recouped. But then, what price do you put on perfection?